After KiGa, Seb can usually be found unwinding with a good book. Seb is growing cuter and cuter every day. It turns out that having a “kid” as opposed to a forever-baby like our mama hearts always want, is way cool. I am not going to say that there aren’t those moments when I want so badly to have him back as that tiny little 6 lb. newborn, or get those chubby cheeks and that toddling stage again, just for a few minutes, but reality is that we grow and change and learn. And that’s a really good thing. It makes my heart swell watching Sebastian figure out this wonderful, exciting, and even hurtful world we live in. Seb’s vocabulary is growing by leaps and bounds, and his poor little head must be so tired! He’s not only learning English vocabulary, but German vocabulary, and soaking it all up like a dry sponge. At home and away he is constantly hearing words and phrases in German, and his comprehension of this language is astounding after such a short period of time. And lest we forget about Bruno, he says “Tschuss” instead of “Bye,” and is newly obsessed with Bob der Baumeister (Bob the Builder) and with an excited squeal says, “BAHHB... BAHHB.” Oh my little multicultural babes. Now where was I? That was quite a bunny trail. I was talking about how awesome it is to have a little kid. Seb has grown so thoughtful and grown up. I really have to be quite careful because it’s so easy to put too much responsibility on him because he seems so much older than three and a half. Just tonight, I was putting some clean dishes away, and as I tried to finagle a pan up onto a high shelf, one of the metal lids fell with a bang to the floor. I finished placing the pan where I needed it to go, but before I was done, Sebastian came running over, picked up the lid and said, “Here you go, Mommy!”. Seb notices everything. This means that he asks approximately 1,000,000,000,000 questions everyday, and is easily distressed (both of which can be hard to deal with), but this also means that he takes care of us. When Bruno is getting his diaper changed—not his favorite activity—Seb frequently trots along behind and says, “I’m going to make Bruno happy!”, and is often seen running around trying to find a good toy for Bruno to play with. 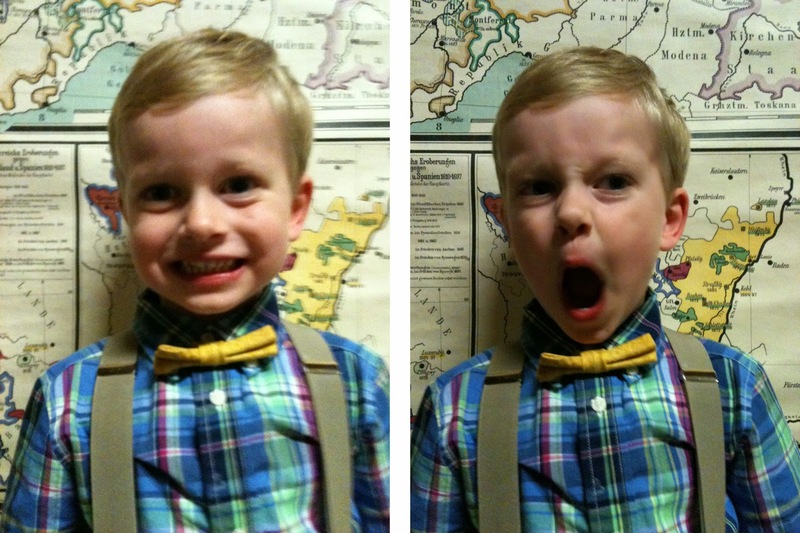 I love this sweet little kid of ours, and tell him every day that he is my sunshine. He is learning to be proud of what he does, developing his own sense of style (however much I don’t like suspenders and sweatpants as an outfit! ), and even takes time to compliment me when something in our home looks nice with a, “Oh that’s great!” or “Thanks for doing that, mom!”. He likes to be in on the conversation and says, “Mom, I don’t know what you’re talking about,” when Cody and I are talking at the table. He thinks marshmallows are a “cozy” food. He is curious and thoughtful, sensitive, and resilient. I couldn’t be happier to have this little man in our lives, and am so acutely aware of how privileged I am to be his mama that it hurts just a little bit. And just because I love this picture... Seb watching Micky Maus Wunderhaus (Mickey Mouse Clubhouse). Now suspenders and JEANS is a look I can support 100%. Also, I've given up on matching socks. Growing up, Halloween was never really a holiday that we observed. We lived in the country, with few other houses, so it couldn’t really be a neighborhood thing (somehow trick-or-treating with a car isn’t quite as thrilling), and so we would only occasionally dress up if we had an event to attend. And honestly, I’ve kind of taken that approach with our children so far. Partially because in the last few years they haven’t been old enough to enjoy it, and so I haven’t bothered. These facts made it all the more surprising to me when this year, nestled in this cozy, but admittedly halloween-less land, I really missed the festivities! I didn’t miss the tacky or gory decorations, but I missed seeing and savoring pumpkins on every stoop, and the candy corn, caramel corn, hot apple cider (essentially, the food), corn mazes, and hay rides. I think I counted a total of 4 carved pumpkins displayed outside various homes, and no costumes whatsoever! Halloween just isn’t a thing here. But then, just when it seemed like this lovely autumn season was going to go by without any festivities, Laternelaufen happened. 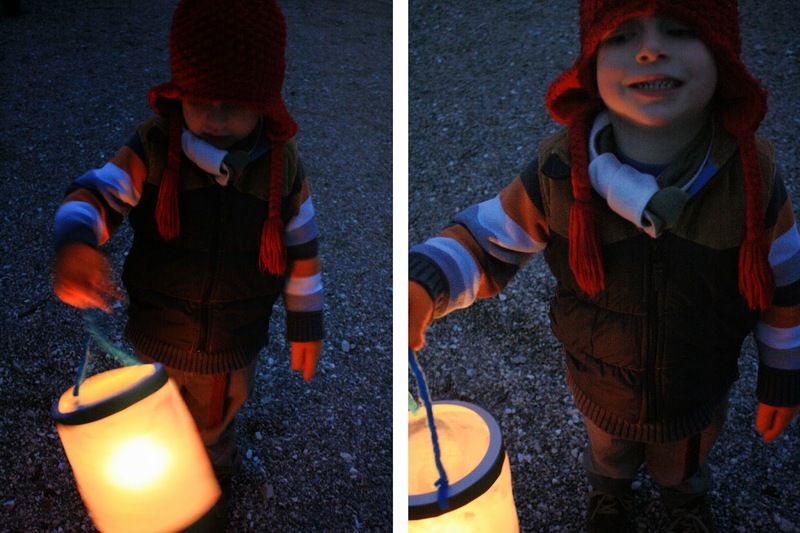 St. Martin’s Day is on November 11th, but Sebastian’s KiGa (Kindergarten) celebrated early with a Laternalaufen—literally “lantern walk”—on Tuesday evening. No one knows exactly why this tradition is attached to St. Martin’s Day, but presumably it has to do with bringing light into the world through love and selfless giving to ones neighbor. St. Martin, a soldier, is remembered first for having given half his soldiers coat to a beggar in danger of freezing to death. At first I thought this tradition was little observed in Germany, but I am quickly realizing that families, and communities, observe St. Martin’s Day with a fervor akin to our American Halloween. A holiday that brings a community together, lighting the way in a darkened world, and stopping along the way to sing about it? Now that’s a holiday I can get excited about! 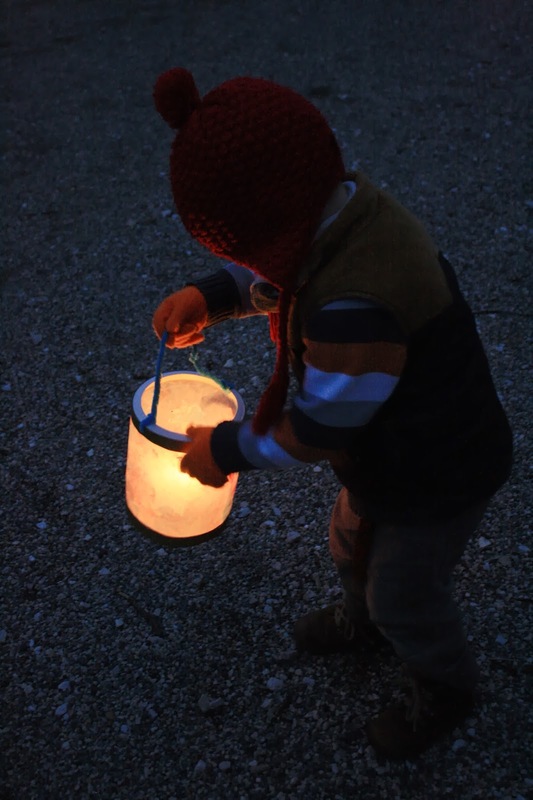 The children carry colorful lanterns with endless variations. Some homemade, some store bought, but all charming and vibrant. Thanks, Germany, for restoring my faith in your holiday observances. I can’t wait to see what you do with Christmas! Experiemnting with the settings on my camera on the way to the Laternelaufen. What a cute test subject, no? Taking it all in just before the Laternelaufen began. This little goof saw me trying to take a picture and started kicking up his heels. Early this morning, we willed ourselves out of bed, got dressed, ate breakfast (or in my case, imbibed coffee), and walked to the train station with our neighbors. The K family have a small son, perfectly sandwiched in age between Seb and Bruno, and have been quite possibly God's greatest gift to us here in Germany. Ben speaks a little English, just enough to help us as we bumble our way through learning German, and Caro speaks even less. She is so patient, and kind, and truly hardly notices our lack of communication skills, which constantly amazes us, and she has this completely sweet and endearing curiosity about America. What an angel she is to us! Leave it to Caro to be an encouragement when we're feeling like grasping the German language is a complete impossibility. God really does know better than us what we need, and the push that will get us out the door on tired days. He gave us this family who constantly invites us to do just about everything with them, including eating breakfast or afternoon snacks and coffee with them, exploring parts of our city, and today, taking in the sights of other cities nearby. It feels like college again, with this sweet gift of a family just down the hall, dorm style. (Sometimes, I even refer to Caro as my German Megan, which is saying a lot). 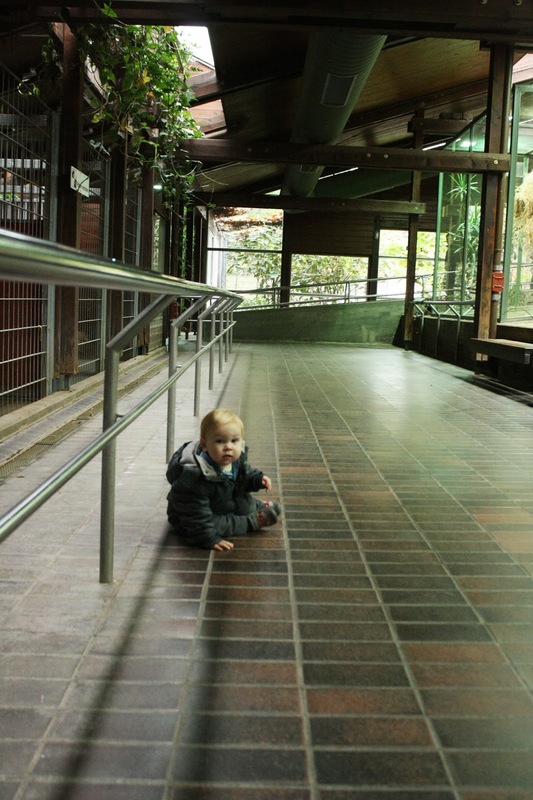 And so, true to their generous way, they invited us to visit the Wilhelma Zoo in Stuttgart with them. 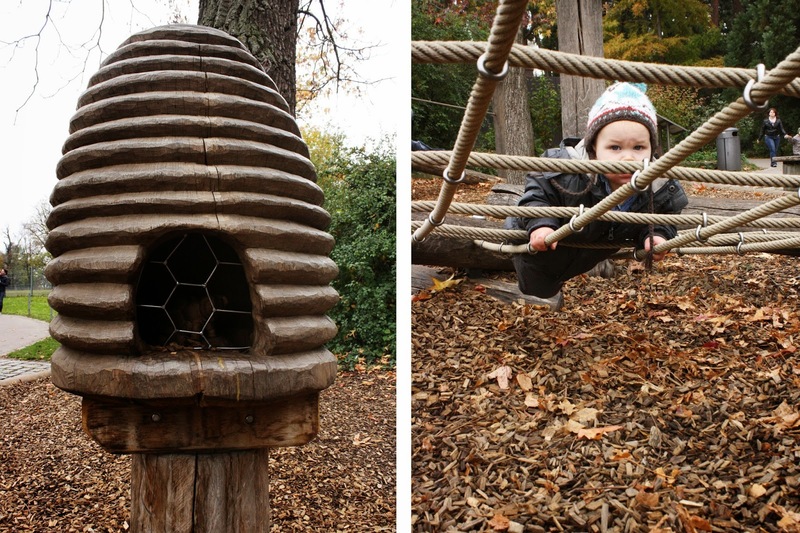 It was a chilly, cloudy day, but we bundled up (the boys wore tights under their pants), and embraced the adventure. The train ride was pleasant, and passed quickly due to the congenial company in our midst. On the way home, Bruno and David fell asleep, and the adults engaged in the most enjoyable conversation about the nuances of the German and English languages, as well as pop culture in Germany and America, which naturally included reality TV and TV series. It all ended with the men realizing, marked by jubilant laughter and dude high fives and the like, their common love of the Die Hard movies. These are the faces of 3 guys that really like monkeys.